It was an experience both magical and memorable when 260 of Community Memorial Hospital’s major campaign donors gathered to be honored for their generous donations that helped build the new hospital. The June 28th celebration began with hors d’oeuvres and spirits, served on what will be the new hospital’s outdoor dining terrace. 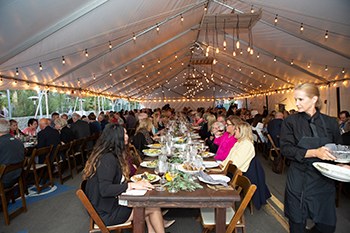 When guests entered the large white event tent adjacent to the new hospital, they seated themselves at farm-style feasting tables decorated with natural greenery and lit by soft overhead lighting that created the casual, warm ambiance of an outdoor farm-to-table dining experience. Donors enjoyed a farm-to-table dining experience on the grounds of the new Community Memorial Hospital. After a warm welcome and hospital update from President and CEO Gary Wilde, followed by words of gratitude from Campaign Co-Chair Bill Kearney, the evening’s chef described the various courses, their preparations and seasonings as each was served. The sommelier chosen to select the wines discussed each pairing, helping both wine connoisseurs and neophytes alike thoroughly appreciate the experience. Guests enjoyed two plated selections, followed by a family-style course featuring delicious short ribs and salmon. 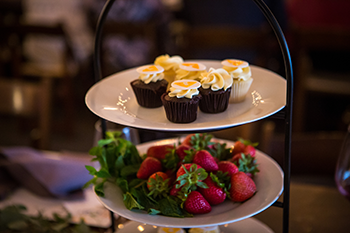 For those who still had room, fresh strawberries and petite cupcakes topped with the hospital’s logo in icing, were served for dessert. Dessert included petite cupcakes topped with the CMHS logo in icing. The evening’s delights didn’t end with the dessert course, however. There was much joy, laughter, and perhaps a few tears of happiness yet ahead for the attendees. Each donor was offered an opportunity to have their picture taken at the space that will bear their name in the new hospital. Entering the “Ocean Tower,” as the new hospital will be known, donors were immediately drawn to the large area where their names were displayed on marble paper that served as a temporary donor recognition wall. Emotions ran from delight to sentimental as some had their pictures taken pointing to where their names appeared, while others shared how much a deceased loved one would have wanted to be there to see this new hospital become a reality. Donors visited the spaces that will bear their names in the new hospital. 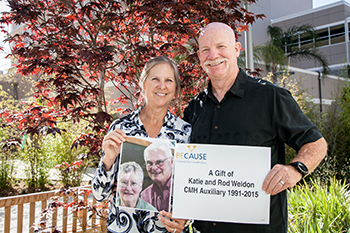 Many dedicated their gifts to loved ones. Moving on to stand in the area specifically designated by their gift, donors were photographed holding a sign indicating that this space was “A Gift From” with their names inscribed. Several held a photograph of a loved one in whose name the gift had been given as a memorial. Named spaces ranged from entire floors to departments, from patient rooms to operating rooms, and from trees to fountains and gardens. Numerous naming opportunities are still available for anyone wishing to become a donor. Please call the Development Office at 805.667.2885. Community Memorial Health System is extremely grateful to all its Community Memorial Hospital Campaign donors and to the generous individuals and businesses whose donations of food, beverages, financial and other support made the evening so memorable. These special contributors include: Union Bank, Ventura Rental Party & Events, Ventura Spirits, Mission Avocados, Avo Pacific Oils, Petty Ranch, Houweling’s Group, Underwood Family Farms, Season’s Catering, Lapis Luna, Cafe Ficelle, Simone’s Coffee, and In the Mix Events. 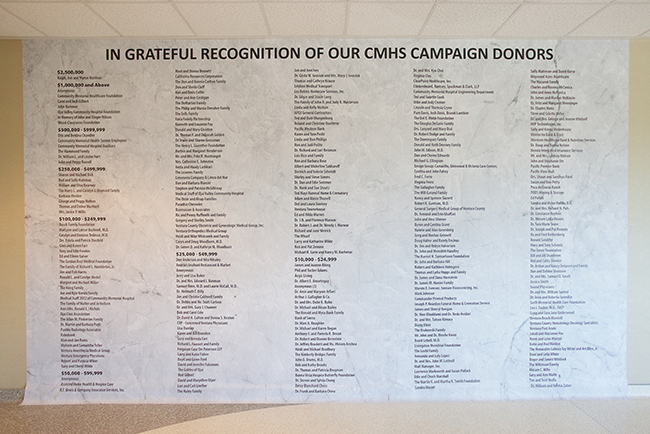 Donors had the opportunity to visit a mock-up donor recognition wall to see where their names will be displayed when the final marble wall is complete.